People are always tell me how organized I must be since we have six kids and I have my fingers in all sorts of stuff. I’m not, you guys. I’m just not mega-organized in all aspects of my life. The biggest source of struggle for me? But guess what…I have some fantastic tips on how to get a grip on it all! Our kids after-school sports/activities schedule is on a separate calendar on my phone but I needed something for the every-day. You know, so I don’t schedule trips on days they don’t have school, or don’t double book a doctor appointment on the same day I have a speaking engagement, that sort of thing. I needed to get a better grasp on things because I was drowning in double-bookings and scheduling things poorly, which wasn’t allowing me to accomplish all I needed to do. Or perhaps it’s not work-stuff that’s bogging you down, but mom-hood in general (hand raised here!!). You know, things as simple as scheduling a get-together the night before your son’s huge science project was due (oops). Or maybe being excited your mother-in-law was coming to visit before realizing it was finals week for your oldest and they would be holed-up studying the whole time and not able to play. A few months ago, my dear friend Lindsay Sherbondy (also known as Lindsay Letters) sent me a wall calendar unlike any I’ve ever had. A wall calendar? That’s it? That’s your amazing organizing tool?? (**yawn**) I’ve had one since high school. This is different…and so is how Lindsay taught me to use it. But here’s the thing: it’s not just what we use…but how we use it! First of all, let’s talk about how pretty it is. Everything Linds makes is like the prettiest thing you’ve ever seen. So there’s that. But you also have an opportunity to select all sorts of options so it fits perfectly in your space AND perfectly fits your needs. Are you freaking out about all the options yet? I know…how do you choose, right?! But here’s the great part: Unlike most calendars that are made of paper, this one is covered in plexiglas which means it basically lasts forever (there is also a wall-peel option, check that out too!). After the month, quarter, year, or whatever, is over…you simply wipe it clean and start afresh! Ok ready for some tips on how to use it to stay mega-organized?? I certainly like that dry erase and wet erase markers can be used for different purposes but what I LOVE is the ability to use more than just pens to help me remember various things. Because of the way my brain works, other materials such as washi tape, post-it notes, tags, etc easily pulls my eye toward exactly what needs to be done and highlighted… basically separating or classifying various projects and topics. Want to understand better what I’m talking about? Head to this quick little video and see what I mean! What do you think? Was that helpful? I sure hope so…because it’s truly been invaluable for me! And if you’re wondering, my calendar is The Quarter Cal. I don’t have a ton scheduled for the rest of September but I know there’s a lot of travel, etc coming up in October and November so I went ahead and started those months a little early to make sure I’m set up for success! If you haven’t already fallen in love with Lindsay’s crazy-creativity (and her dry humor…she’s just so fun. Check out her IGstories)…then I’m so excited to have changed your life for the better. Head here to see more of her AMAZING hand lettering and artwork! 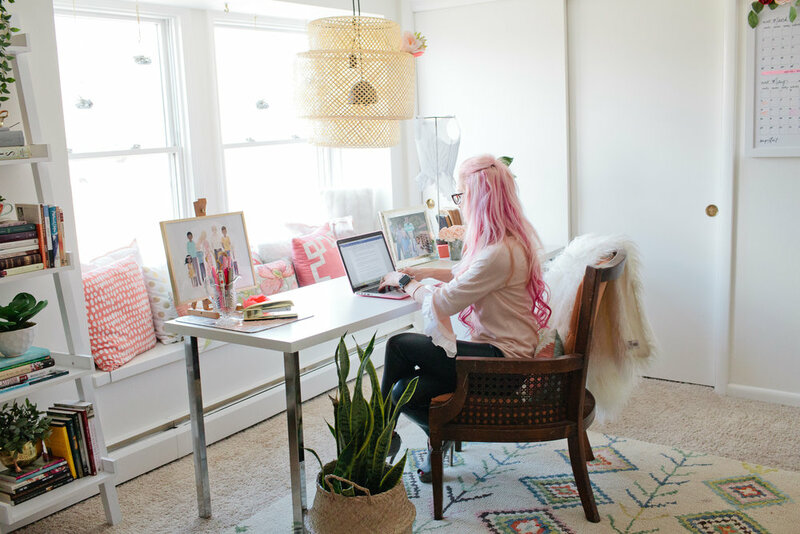 I am SO crazy excited to share some before and after photos of my office today. It's a weird space because it's actually a walk-through that takes you from the landing at the top of the stairs, into our Upper Room (or rec room) over the garage. Did you know that there wasn't a stitch of white in this entire house when we moved in? Not even the doors, trim, and ceiling. I know these photos make it look white, but it was really more of a dingy-whiteish-peach color. Ok, ready for the after?! I know, me too...but you're gonna have to wait just a minute so I can show you the before-ish after. In other words, how I had it for three years after moving in. As you'll see, it's certainly better, but I always felt it was missing something. It felt thrown together, it felt disjointed. For some reason, I was completely stumped on this space. Better...but still far from the AFTER! I loved being next to the big window because the room gets the most glorious afternoon sun. The problem was though, it wasn't totally the right height for my chair and was too small to really spread out and work from (when I research, I have books strewn all over the place). Basically, I want somewhere that just oozes creativity. I want clean and simple but with bold pops and a touch of boho. I CANNOT figure out how to do boho. AT ALL. Anytime I attempt it, it looks stupid (eye roll). BUT, I love when others pull it off...it just feels cozy and lived in. 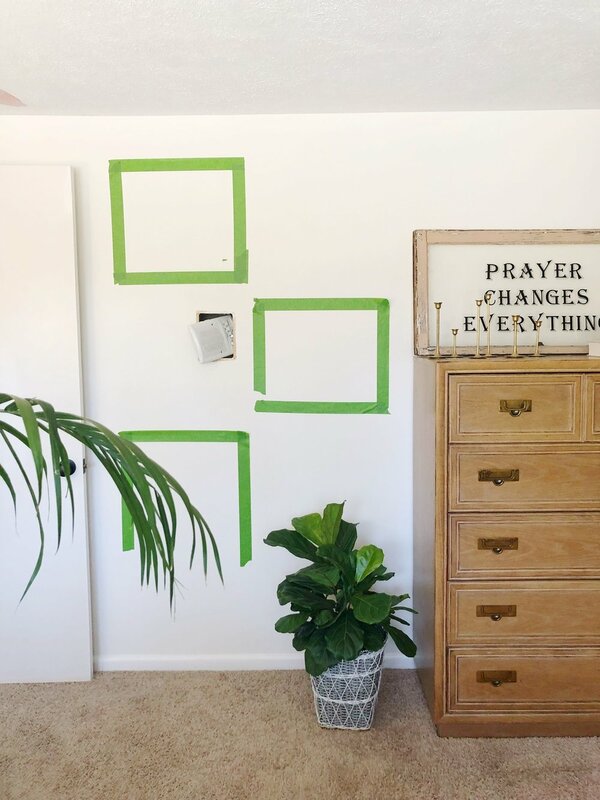 I've learned so much from Leah during this process...check out how she decides where to place frames! Painters tape?! Amazing. Because we have both had sick kids the past few weeks, the project took a little longer than we planned and it sat halfway done for a while. A week or so ago, I finally texted Leah this little video with some progress and thoughts (see video-text below). Finally our kids were well again...and because Caleb from Unmutable was flying in to do video work for my upcoming book trailer, etc we knew we had to get going and finish. Mere days before Caleb arrived for the big shoot, the room was complete. And I'm still freaking out over how beautiful it is (ignore the light wires though...still working on that part)! Ok so I forgot to tell you something important about the design... I told Leah I didn't really want to buy anything. I wanted her to shop my house and use what I already have. We pulled things in from other rooms, ransacked closets and the basement. The only items I purchased were plants, baskets, and the awesome light above my desk (which still needs to be connected). I really wanted a pop of something on a portion of the walls, but didn't feel wallpaper was the right look for this space. We were SO thrilled when Urban Walls told us they wanted to work with us because these amaaaaaaazing decals are THE perfect addition, don't you think?! I love how some were placed up slightly onto the ceiling, too! In case you're thinking this room cost lots of $$ to decorate, I want to share a little secret with you...most of it came from Goodwill, Target, garage sales, and clearanced/sale items from shops I have a feeling you totally frequent. I'll chat about where the decor items and furniture are from in another post, but remember...this space is almost entirely designed with stuff I already had. It's just displayed differently! Do you see my book up there next to the Prayer Changes Everything sign?! Shhhh...I'm not officially sharing this yet, but you can preorder it on Amazon! How cute are these little guys?! I found the glass globes in Target's Dollar Section last year but the rocks and air plants are available there right now (near the seeds + summer furniture)! They're now hanging in the window. I'm in absolute love with how the bookcase is styled now! It's still organized according to subject like I'd wanted/needed for writing and researching, but Leah made is look so much better. I'm obviously in love with swans since Swanstrom is my maiden name and adore how my logo (painted by my dear friend Amy Kavs) is highlighted front and center! And those vintage brass swans are perfectly placed right below (next to that adorable succulent from our grocery store, of all places!). 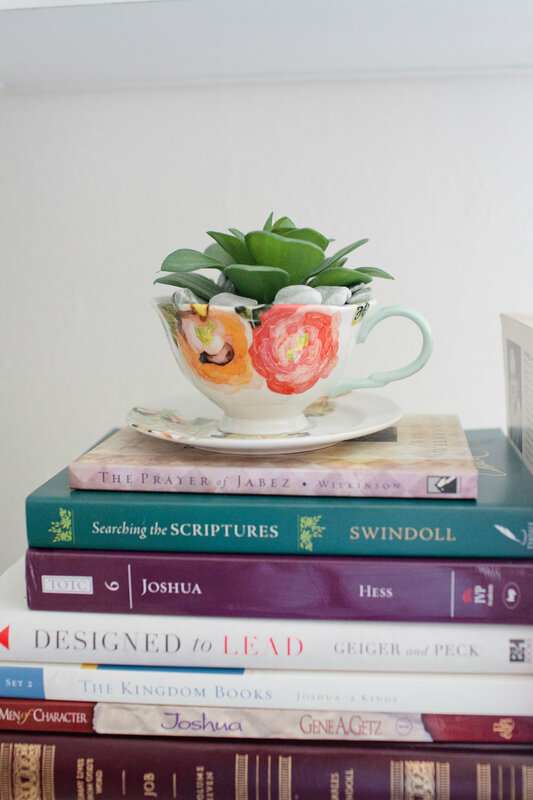 And how great is this idea to place a (faux) succulent into a teacup from my collection? I'm definitely going to copy this next time I need a gift! 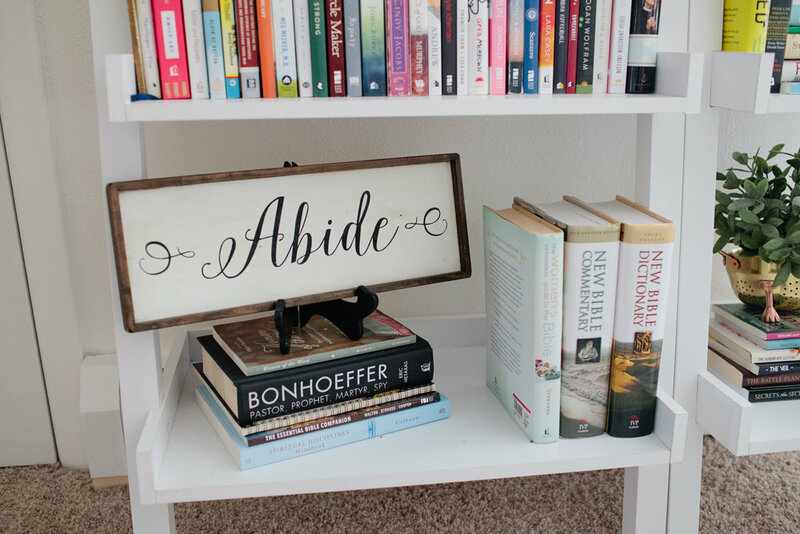 This Abide sign was gifted to me by a group of incredible ladies I had the honor of speaking to in Royal Oaks, MI last year. I don't know why I never thought of putting it on a shelf with a plate holder! I looooove it here! And can you see off to the right-hand side how a little brass and gold colander is used to hold a faux plant? (I know it's just barely shown, but is too cute to ignore!) So creative. I found the live plants at Home Depot, Walmart, and our local grocery store...but admittedly, we mixed in a few faux plants as well! If you don't have a green thumb or can't find the right plant, why not mix fake ones in?! I'm so excited to share this calendar with you. I've really been trying to become more organized since the new year began. 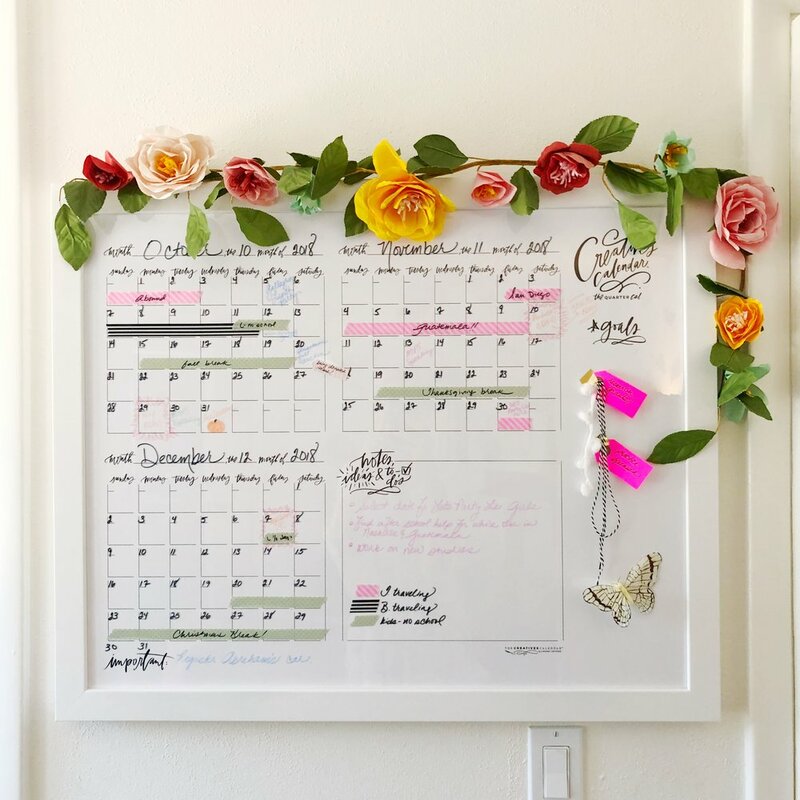 I'm going to be sharing more on my sweet friend Lindsay Letters' calendars in the next few weeks as I reveal organization tricks + tips for us ladies who aren't naturally that way. I cringe at telling you this but it's a struggle for me to be organized. Like REALLY struggle horribly with living organized. I don't mean a clean house...I mean an organized life in general. Schedules, intentionality, that sort of thing. These past several months though, I've realized how much less stress I feel because I'm consciously working on it. That's a whole 'nother blog post so more on that coming soon! From dark and serious...bright and happy! Can't wait to share more on Lindsay's calendar, organization, and how I made that cool paint brush art piece next to my easel! Stay tuned! My favorite part (other than now having space for my easel) is I still get to work in that big bright window! It never occurred to me to carry my big desk and fit it in next to the window seat...it fits perfectly...and now the kids can sit facing me, snuggled in all the pillows and draw on opposite side of the desk while I'm working. I love it so much. What do you think? What's your favorite part of the redo?